The more computers you have (mobile, laptop, desktop), the bigger hassle it becomes to get your media when you want it, on the device you want it. Apple deals with this by making you constantly sync your iPhone with your laptop. It involves cables and transferring files. Microsoft’s answer to effortless sync is Mesh, but that is still in beta after two years and is Windows-only. An Israeli startup called Libox thinks it has a better way and it is available right now on your desktop, on the Web, and on the iPhone. Libox is a peer-to-peer application that scans all the media on your primary computer (photos, videos, music) and then streams it to other devices with a Libox app or browser. The iPhone app just went live in iTunes a few hours ago. 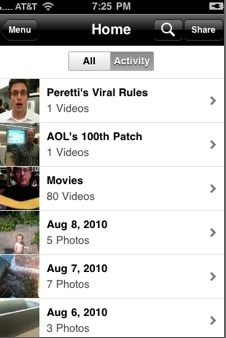 You can see all your photos, and play all your videos, and even listen to your entire music collection. It is all streamed from your laptop, which acts as a server. It does require some set-up. First, you must download the desktop app from Libox, which scans your computer for all your media (photos, videos, music). This can take a while, and of you have a lot of media (as in thousands of photos and songs), it might take a few tries before you the scan gets everything. This part is still a bit buggy. But once you scan your computer, all of your photos, videos, and music is available from any computer with a browser, and now on your iPhone via the new app. It works exactly the same on the mobile Web in both iPhone and Android browsers. Whenever you add more media to your computer, it is automatically available everywhere else without any cables. Libox transcodes the files into formats that can be streamed to whatever device you are on. The catch is that your host computer must be on (the Libox app works in the background). 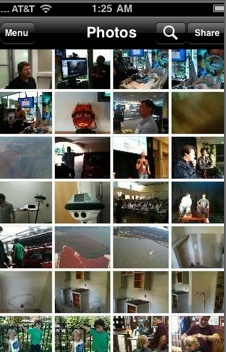 Eventually, Libox will supplement this by making the media you access the most often available via the cloud as well. Because of the way the iPhone works, media that you create on your phone such as photos or videos still have to be manually synced to your computer before they can then be made available again via Libox. With the Android app, which is in the works, it will just sync wirelessly via WiFi. For mobile phones with relatively limited memory, you can offload your videos and photos, but still be able to see them on the phone. Being able to get to your own stuff is very useful, as long as your keep your main computer on. 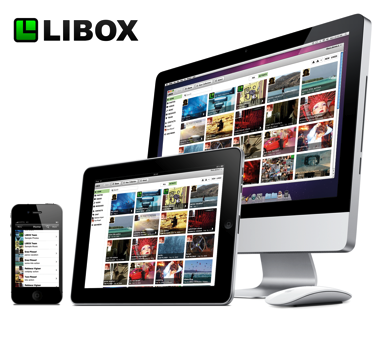 But you can also share your media with other Libox users. For the most part, this does not present an issue with photos or personal videos, but with music or Hollywood content that could raise the attention of the copyright enforcers. However, Libox is not really designed for mass sharing, so it might not be a problem. A bigger risk for Libox is that Apple, Google, and Microsoft will end up doing the same thing and baking it directly into their products. It is time to get rid of those syncing cables and they know it. Until then, though, there is Libox. The company’s founder is Erez Pilosof, who also founded Walla!, the Israeli equivalent of Yahoo! He has raised only $2 million in seed funding from Evergreen Venture Partners and Rhodium.